Khoredia Mbodji has been the president of the Keur Niene Serere Market Garden, since its inception three years ago. She is a strong and determined woman who is a leader in her community and she is proud of what they have accomplished. Keur Niene Serere also recently received a brand new Community Health Post where mothers can safely deliver and others can seek basic care. We sat down with Mbodji to ask her about her experience working with Andando. “I have learned so much since Andando has joined us in Keur Niene Serere. Andando has brought us a garden and a health post for our population and the surrounding villages. Through these investments, we were taught the new techniques of market gardening and all organic methods. Before, we mostly grew only one thing during one season, but now we have mastered other techniques for many types of gardening and techniques to develop nurseries, as well as the reforestation of trees. “Since the arrival from Andando to the Keur Soce area, we have improved our socio-economic living conditions. We manage to grow vegetables, sell some of them to earn money to take care of some of the daily problems of the family, and contribute to the schooling of my children. Andando allowed us to have access to organic vegetables that are prepared in our different meals. Previously, we bought these vegetables at a premium in Kaolack. Now, we have these vegetables, we also sell them at the weekly markets and we sometimes give some to our family members who come to visit us. 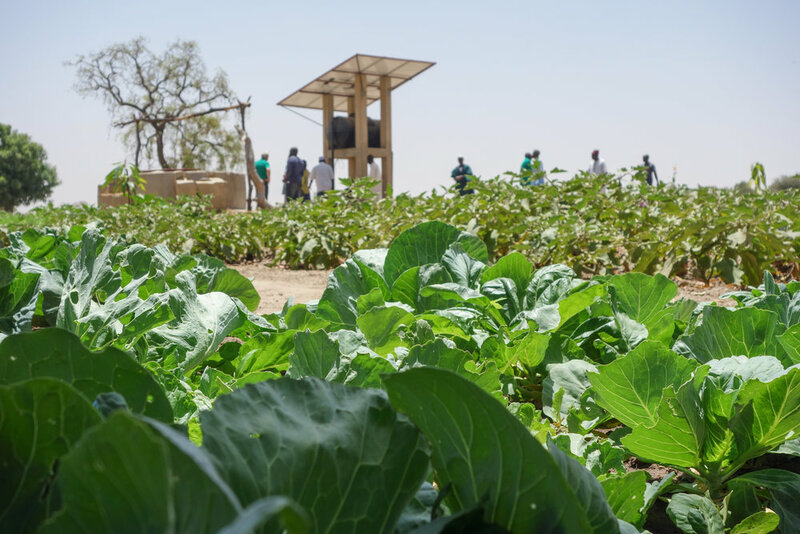 Cabbages growing at Keur Niene Serere Market Garden fed by water drawn from the solar-powered pump. “The project has changed many things in our day-to-day life: access to vegetables, getting used to working or undertaking agricultural activities, and helping to improve our health. We have become dynamic and entrepreneurial women. Before the arrival of Andando, we spent all our time under the trees just discussion things that led us to nothing. However, since the arrival of Andando, the activity of the garden has become our main concern. “Not only is this important for our community, but the project extends its effects to the broader population with the gardening and the health component. The community has access to vegetables that they did not previously, and we are able to seek care and treatment in our own village. Even more so, the surrounding villages come to stock up on vegetables and seek healthcare in Keur Niene without having to make the laborious and expensive trip to Kaolack and back. Everyone feels the positive impacts of these programs. Members of the Keur Niene Serere Market Garden attend a workshop in the garden. “These things have contributed much to my dignity and well-being. First, it allowed me to have knowledge in market gardening, then it allowed me to be autonomous socially and financially. Before the arrival of Andando, there was not much for me to do. I struggled to manage my problems on a daily basis, and I had to ask for social assistance from my neighbors in the village. Generally, it was disheartening. Now thanks to Andando, I became a fighter, because I work in the garden and I manage to meet my needs and those of my family and my children. With Andando, poverty here is being reduced. I do not hold out my hand and even if I borrow money, I intend to repay in the time because with the garden I am a woman in activity and employment. “In the future, we hope to do even more, like try to have toilets in every house in our community, setting up a poultry project for the women, and strengthening the capabilities of the Health Post.